Men’s tennis (13-8) pushed through a rough patch in its season by sweeping No. 22 Miami 4-0. For the doubles portion of the match, senior Christopher Morin-Kougoucheff and freshman Fabien Salle played at the No. 1 spot, senior Federico Gomez and freshman Alex Wesbrooks played at the No. 2 spot, and senior George Hedley and freshman Sergio Hernandez played at No. 3 to make for three senior/freshman pairs. Court three fell first with a score of 6-2. Court one and two were down, but managed to turn things around. Finishing first of the two was No. 2 Gomez and Wesbrooks with a 6-4 win. Following them was No. 1 Morin-Kougoucheff and Salle with another 6-4 win to secure the doubles point for the Cards. Three of the six singles matches went into thirds sets, as Miami proved to be tough competitors. Salle finished first at the No. 4 spot with an easy 6-3, 6-2 victory over No. 81 Bojan Jankulovski (UM). Next, Morin-Kougoucheff defeated No. 27 Soriano Barrera (UM) 6-4, 7-6 (5). To clinch the match, No.2 Brandon Lancaster fought for a 6-4, 3-6, 6-2 win over Miami. No. 3 Hernandez, No. 5 Gomez, No. 6 Clement Filho all split sets and were in the third when the match ended. Hernandez was tied 1-1, Gomez was up 1-0, and Filho was down 2-3. 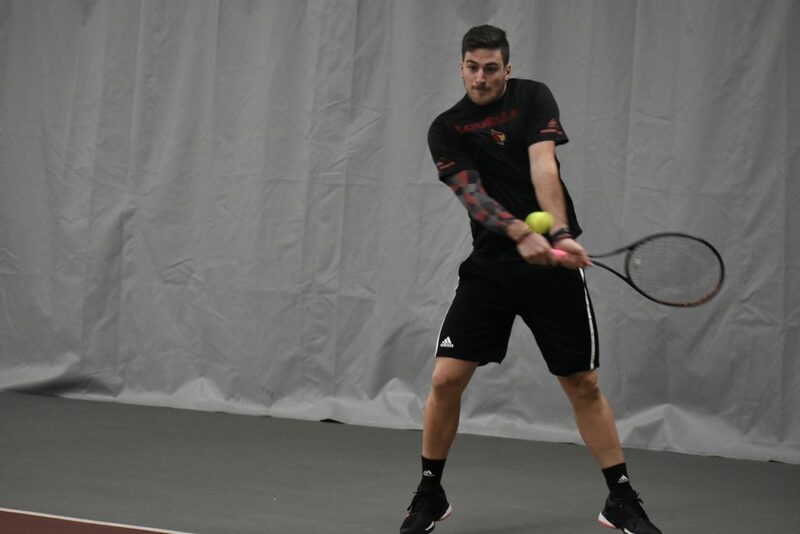 The Cards host a doubleheader against Duke and Illinois State on Sunday, March 31st at 1:30pm and 7pm at the Bass Rudd Tennis Center.